Mar. 29, 2018 11:45 a.m. Buried deep below a sandy beach and pressed into soft clay, footprints from an ancient time hold clues to life for some of North America’s early humans. At least 29 footprints have been identified on Calvert Island in British Columbia and confirmed as the earliest known of their kind on the continent. 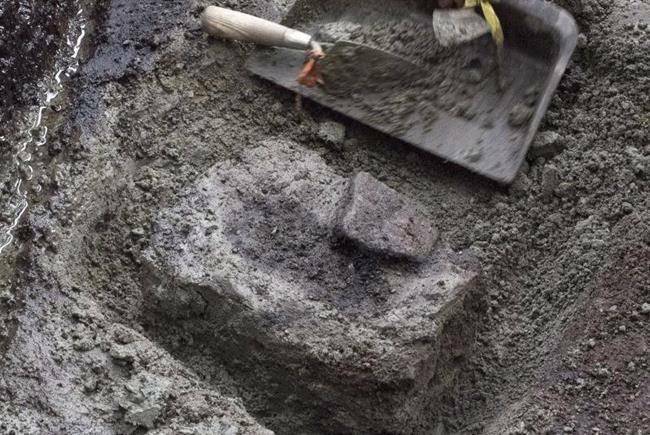 Researchers at the University of Victoria’s Hakai Institute published their findings in the journal PLOS One on Wednesday, corroborating earlier indications of the age of the prints at about 13,000 years old. Lead author Duncan McLaren first reported 12 single footprints in 2015. The footprints come in at least three shapes and sizes, including at least one child and two adults. They appear to have been left by bare feet that had gathered around a focal point, likely a firepit or hearth, rather than following a path. Two side-by-side left and right footprints give a picture of a figure standing with feet slightly apart and facing inland, with his or her back to the prevailing winds. “The footprints were impressed into a soil just above the paleo-shoreline, possibly by a group of people disembarking from a watercraft and moving toward a drier central activity area,” the journal article says. Researchers determined the age of the prints by carbon-dating preserved wood embedded in the tracks. The dating puts them in the Pleistocene epoch. “Fossilized footprints are rarely found in archaeological sites,” McLaren said in an emailed statement. A single footprint in Chile was found to be more than 14,000 years old, while two tracks in Mexico date back more than 10,000 and 7,000 years ago. What researchers thought to be a 40,000-year-old trackway in central Mexico has since been attributed to recent quarrying activity, the article says. Ancient footprints are typically revealed in coastal areas through erosion, making the B.C. samples rare for the way they were found below the surface, in an area where researchers believed there might be ice-aged sediment alongside archeological remains, McLaren said. “This finding adds to the growing body of evidence that people who used watercraft were able to thrive on the Pacific Coast of Canada at the end of the last ice age,” he wrote. It also gives new information to the line of archeological research into human migration in the Americas during the last ice age, which McLaren said is in its infancy. The researchers believe there to be more even more footprints at the Calvert Island site, but are leaving them untouched. They hope future scientists with more advanced technology might glean more answers to pre-historic life on the continent.